"Hashkiveynu" Copyright A. Barclay. Lightfast inks on natural vegetable parchment. a 50% non-refundable deposit accompanied by a 50% cheque for the balance post-dated for 30 days before the item is due. Watch for Visa, Mastercard & PayPal details, coming soon! I welcome any questions you may have & I look forward to offering you more efficient service in the future. Technorati tags: religion, Judaism, Torah, Canada, journal, weblog, blog, diary, business, Advertising, Optimization, Flickr, Art, Business. posted by Soferet | 2:08:00 p.m.
Have you ever considered writing in the style of the medieval massoretic codice? Gorgeous fonts. I do write a similar script to the one in your link, except that the ascenders & descenders are less exaggerated. It's called "Ancient" script. 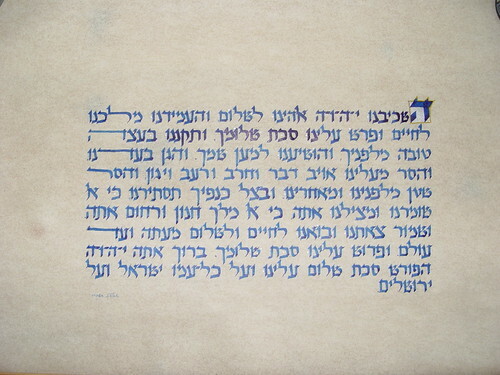 Thanks for your compliments on the Hashkiveynu - that script is called "Yerushalmi" & is a modern version of the writing found in the Dead Sea Scrolls. Do you have a sample of your writing Ancient script? I'd love to see it. Thanks for the info. Again, beautiful writing!